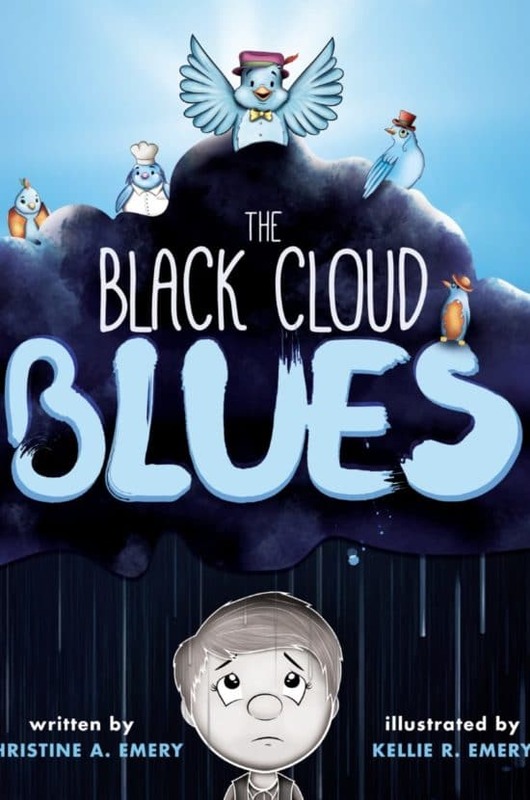 Written by Christine A. Emery and illustrated by Kellie R. Emery, The Black Cloud Blues does the important work of acknowledging childhood depression. In doing so it makes a valuable contribution to children’s literature. Kellie Emery’s deliberate illustrations provide access to the unnamed narrator’s feelings as he takes readers on a journey into his experience with depression. The text opens: “There’s a black cloud hanging over me.” The young narrator stares at the reader with large eyes as a stormy background of violet, indigo, and black streaked with rain visually communicates his sadness. The reader learns that depression is passed down from the child’s father, grandfather, and even great grandfather. By identifying the narrator’s depression as rooted in genetics, Christine Emery gestures towards a shared familial history, subtly assuring young readers that feelings of depression are not uncommon. The child tries to get rid of the cloud, a project explored through the remainder of the text. He visualizes outrunning the black cloud, blowing it away with a collection of fans, and moving it with a crane, all to no avail. This is a project he can’t undertake on his own. The child thinks he will be sad forever and begins to play the blues. An image of him wearing sunglasses and a suit while playing the harmonica lightens the mood inside and outside of the text, but just a bit, just enough for the cloud to budge. The small movement provides space for something new to enter the boy’s world. A blue bird appears and offers to help. The bird begins jumping up and down on the cloud and is soon joined by other blue birds. The cheery birds destroy the cloud and the darkness dissipates. The black cloud is replaced with a sunny sky and a brilliant rainbow. The young narrator takes in the view as his new friends surround him. He can smile and feel joy. This is an important picture book that provides hope without suggesting an effortless path to happiness. It treats mental illness with dignity and children with respect. Even more, images and words share a harmonious relationship that make the narrator’s feelings accessible to even the youngest readers. The Black Cloud Blues will make a wonderful addition to personal and classroom libraries likely filling a gap on even the most carefully curated bookcases. *The author provided me with a review copy. ← Terry Lynn Johnson’s Lost!